This is a very popular Alloy handled WW2 kukri of the 8th Gurkha Rifles, the first known date of the 8th Gurkhas wearing these kukri is in 1930 and they were used through to and including WW2 by both Officers and Rifleman. The kukri smiths have have done extremely well in making the handles in the correct fashion and materials. 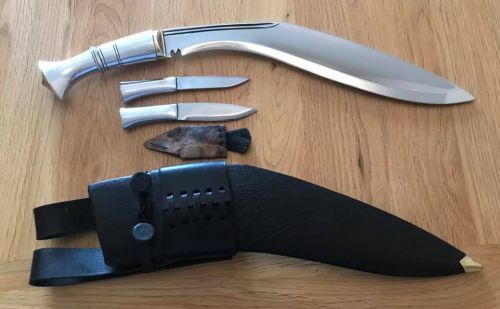 The Kukri has a 31cm long hollow forged/ground blade 5cm, and it has a rough weight guideline of approx 480-550 grams, it is housed in a military scabbard with military frogs, and includes Tinder Pouch, Chakmak and Karda utility knives. Walker had his Japanese body counts queried, when the Officer from Headquarters came to visit him, he arranged for Japanese heads to be put on either side of his Pagoda, which solved the problem of the body count.